The Bangor Rams take on Brewer in this Dec. 2017 file photo. The Bangor High School boys basketball team begins the second half of its regular-season schedule with a major test at neighboring Hampden Academy on Thursday night, but the Rams enter that contest a confident lot. Coach Brad Libby’s club (8-1) ranks first in Class AA North after Monday’s 60-46 victory over defending state champion Edward Little of Auburn. Bangor plays six of its final nine games at home and has only one more than 40 minutes away after earlier sojourns to Lewiston, Windham, Oxford Hills of South Paris and Thornton Academy of Saco. The Rams are midway through their toughest and perhaps most important stretch of the schedule, a five-game litmus test that began with their only loss of the winter at Oxford Hills but was followed up by victories at Thornton Academy and home against Edward Little, two teams that were undefeated at the time. Now comes another challenge at Class A North contender Hampden Academy on Thursday, followed by a Class AA home game against 5-3 Deering of Portland on Saturday afternoon. Hampden (7-1) is coming off a 77-49 victory over visiting Messalonskee of Oakland on Tuesday night. However, the Broncos will be playing without starting center Marc Hutchings, who suffered serious injuries early Wednesday morning in a weather-related accident on outer Essex Street in Bangor that downed a utility pole. As of Wednesday night, the senior was in the Intensive Care Unit at Northern Light Eastern Maine Medical Center, according to his coach, Russ Bartlett. The Broncos represent a significant road test for Bangor, as Hampden has lost just one regular-season home game since Martin Luther King Day in 2010. The Broncos’ only home-court loss since then was a 57-47 loss to Bangor on Jan. 27, 2017 that ended a 62-game home winning streak. Hampden played without then-freshman guard Bryce Lausier, who was out with a broken wrist. Lausier, now a junior, scored 38 points for the Broncos in a recent game against Mt. Blue of Farmington and is one of the team leaders along with senior guard Kory Winch. “Hampden’s tough, especially at their place,” Bangor senior forward Matt Fleming said. The pointworthy games against Hampden and Deering may be pivotal to Bangor’s bid to maintain the No. 1 seed in Class AA North, because the rest of its schedule likely won’t be as pointworthy as their first nine contests. After playing Deering, Bangor has back-to-back home games against the only two sub-.500 teams in Class AA North, 4-5 Windham and 2-6 Lewiston. 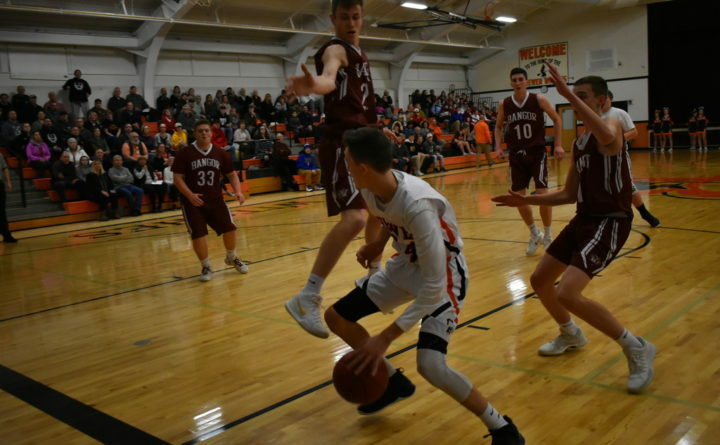 The Rams then have four straight games against Class A North foes, beginning at 0-9 Nokomis of Newport and followed by consecutive home games against 3-5 Brewer and 3-5 Skowhegan before the return matchup against Hampden at Red Barry Gymnasium on Feb. 5. Bangor closes out its regular season at Edward Little on Feb. 7. The top four finishers in the Class AA North standings host regional quarterfinal games before the scene shifts to the Cross Insurance Arena in Portland for the regional semifinals and title games. The Class AA state finals will be played on Saturday, March 2, in Portland.